It has been one of those weeks. Repairs to the house, cleaning for the holidays and dealing with long days at the airport and holiday fliers. To relax I put together a game. Because my son is living at home and has spread out in the basement I was pushed into a corner. 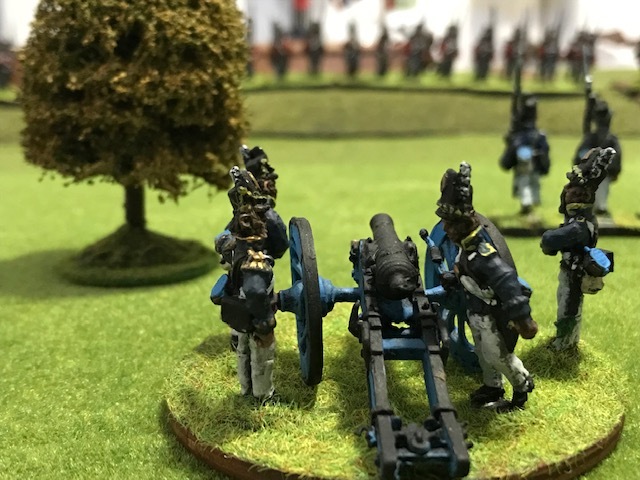 I have wanted to take out my War of 1812 collection and decided to refight the Rev War battle of Cowpens but with War of 1812 figures. 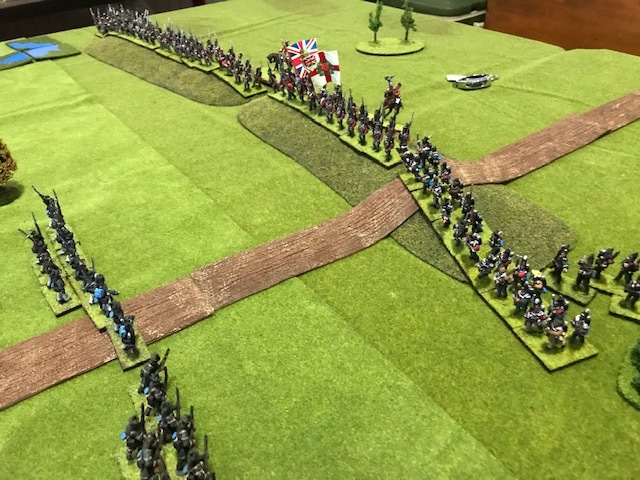 My American army took the role of Tarleton and his British army; while my Canadian-British army took the role of Morgan. The Canadian-British firces under Lt.Col. 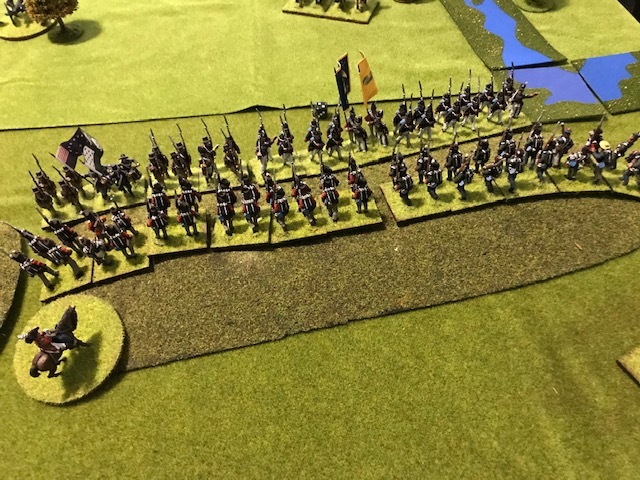 Pearson deployed the Glengarry Light infantry in skirmish order out front. The Lincoln and Norfolk militia formed the second line. The Incorporated Militia Battalion of Upper Canada (IMUC) And 41st hold the third line. In support are the 19th Light Dragoons and Niagara Dragoons. 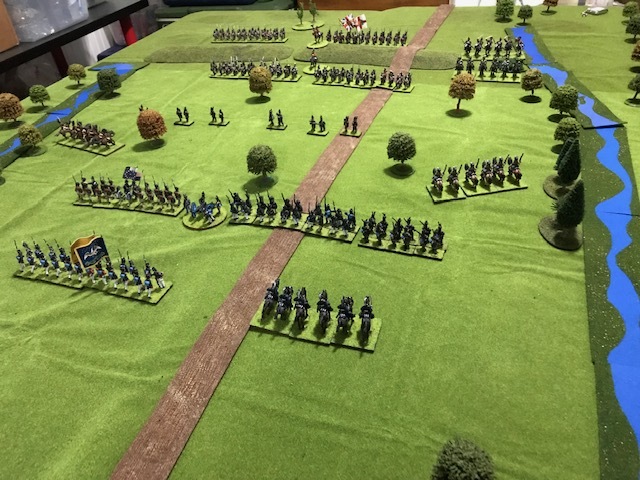 The American commander placed the New York Volunteer Dragoons on his left flank and Militia horse on his right. The U.S. dragoons are his reserve along with the 5th U.S. infantry. His main line consisted of the 1st Rifle battalion, Pennsylvania volunteers and Canadian Volunteers along with a light gun. The American commander marched forward trying to get in musket range. 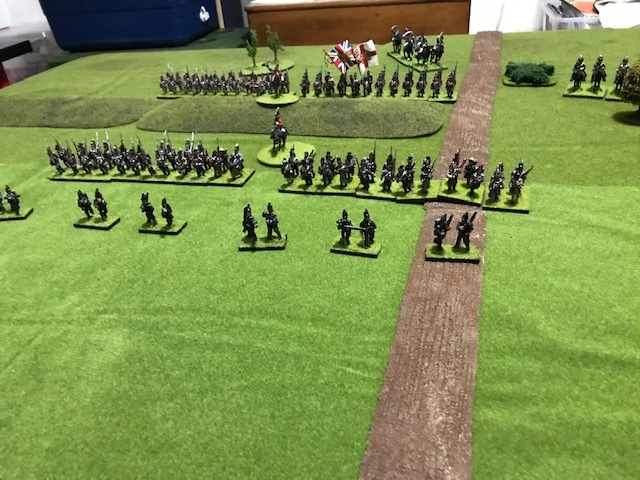 He advanced his cavalry to try and turn the enemy's flank. They were met with a counter charge and retreated. 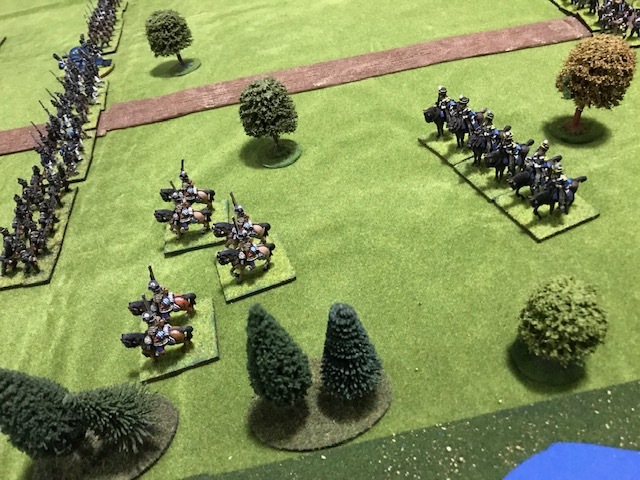 On the left flank the New York Dragoons advanced against the Lincoln militia who emptied two saddles for their trouble. 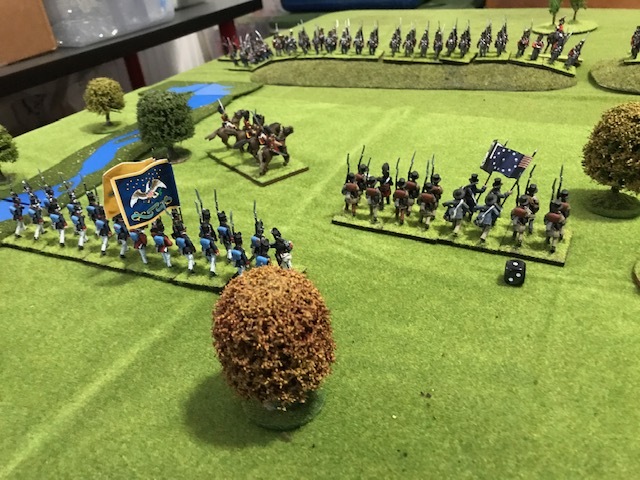 The dragoons remembered they had somethings more important to do and scampered away. The American main line drives the militia back. 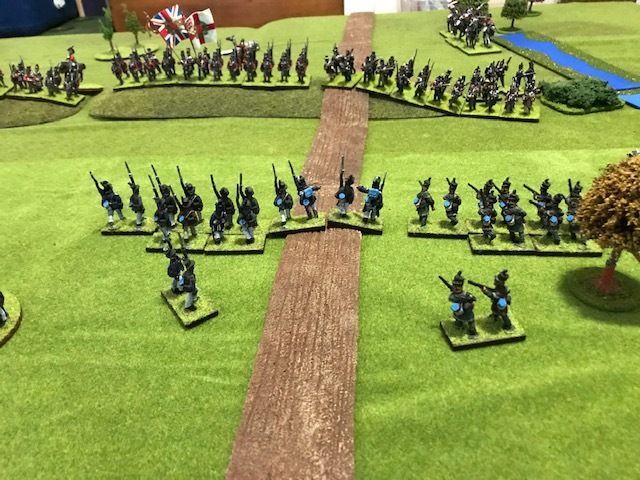 On the left flank the 5th Infantry moves up with the Pennsylvania volunteers. The light gun unlimbered and started firing at the troops on the ridge. The American main line closes with the Canadian and British line. 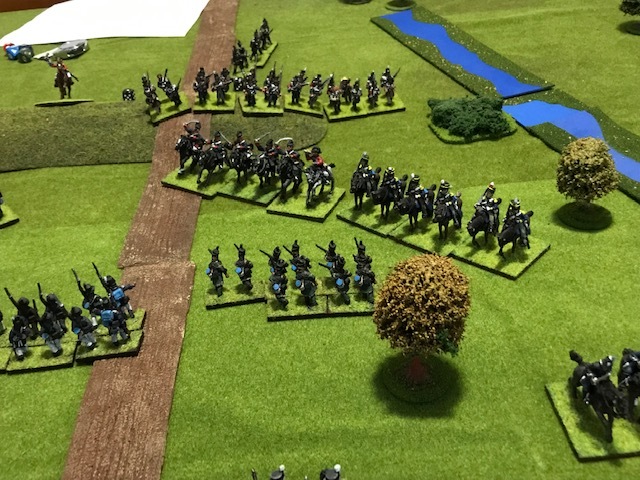 But being table top wargamers I could not resist a cavalry charge. It did not go well. 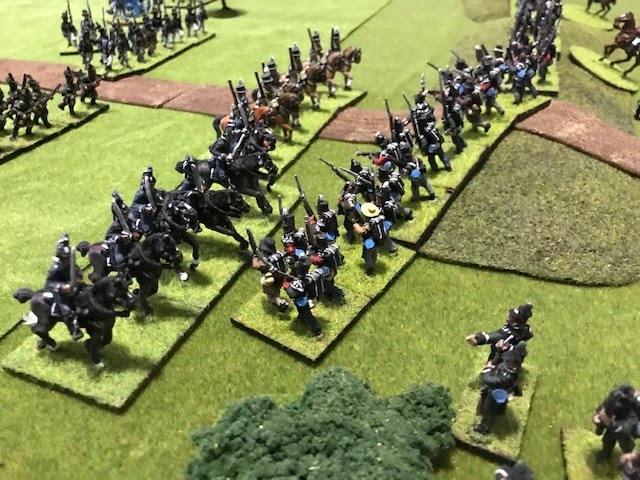 The militia and British line shot down the horses who then raced back home. On the left flank a tremendous fire fight broke out with both sides giving as good as they got. The British commander unleashed his cavalry who then over ran the Rifles and Canadian Volunteers. The 41st swung around to take the volunteers in flank. At this point both sides called the game with a victory to the Canadian – British side . A great fun game in a colorful time period was had by all. I've always liked taking battles and playing them in "another" period. Nice report and a cool game. Thanks. Yes, well done. A "new" battle, but close enough to period to make troop types and terrain plausible. Heresy! I really Like your War of 1812 figures Mark. Well done. Yippy a Canadian victory!!! The day belongs to Upper Canada!